I did this unit with pre-k for half of February, reading The Snowy Day, Pet Show!, Goggles, and Peter’s Chair. Our copy of A Letter for Amy was missing, or I’d have added that one, too. 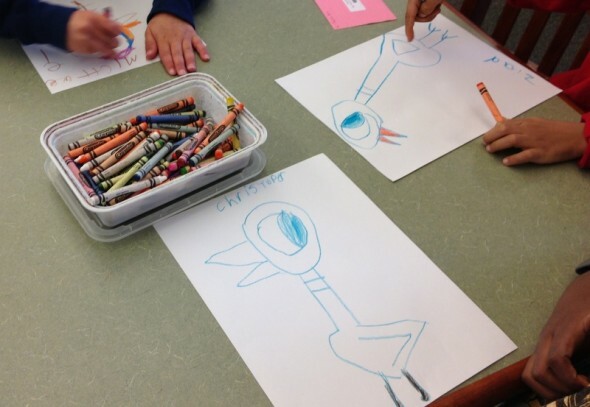 After we read Goggles, we made…goggles. I didn’t have enough cardstock, so we used regular paper. 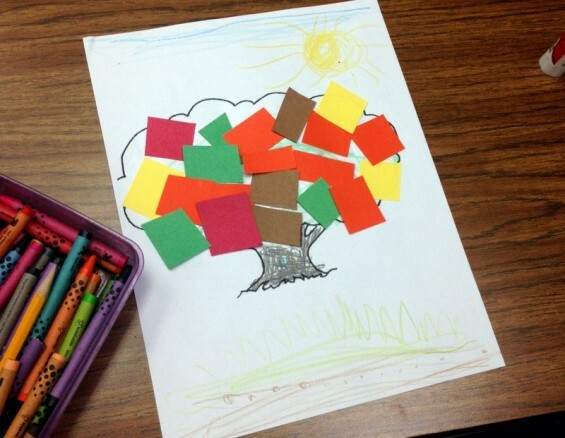 Next year, cardstock. 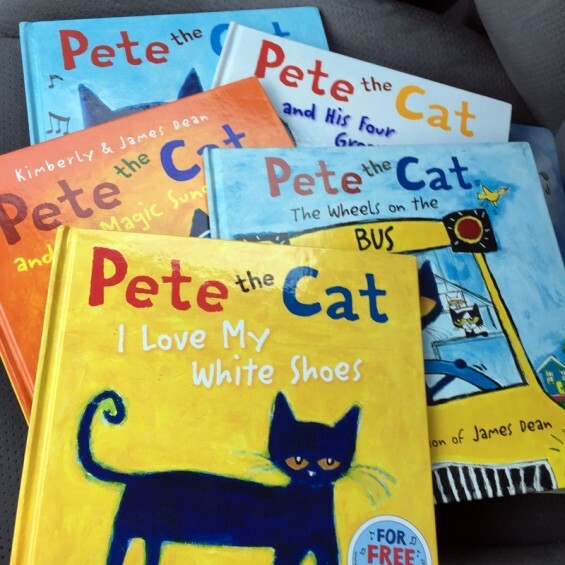 I spent the end of January and half of February reading James Dean and Eric Litwin’s Pete the Cat books, singing Pete the Cat songs, and making Pete the Cat pictures with the kindergarteners. I love the Pete the Cat!!! I’m reading The Strange Case of Origami Yoda with the 5th graders, and before the holiday break we learned how to make origami Yodas. 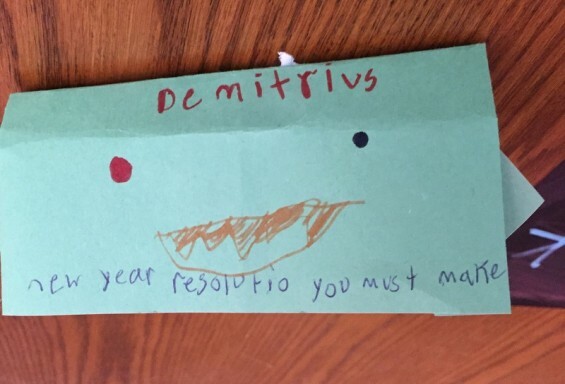 I asked the students to write a New Year message in Yoda speak on their puppets so I could hang them up for January. I haven’t posted about school in forever. 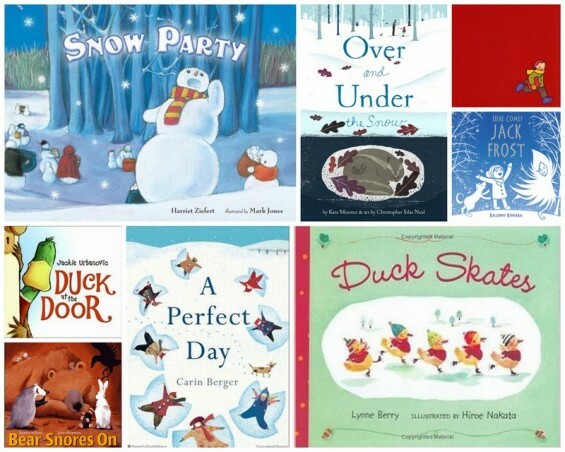 Well, it’s winter, so…we’re reading winter books in pre-k and kindergarten! It snowed this weekend, which makes this even more appropriate to post about. We are well into our novels in grades 1-6, we’ve been reading them since November. And I did a lot of various holiday stories with the little ones in the fall. Now it’s January, so we’re enjoying some snowy stories. 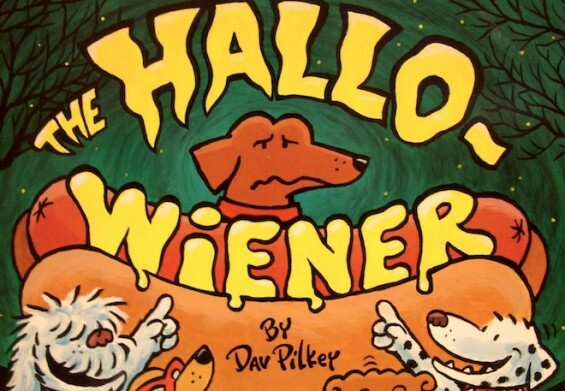 Last month I read a ton of fall books with the two pre-k classes. 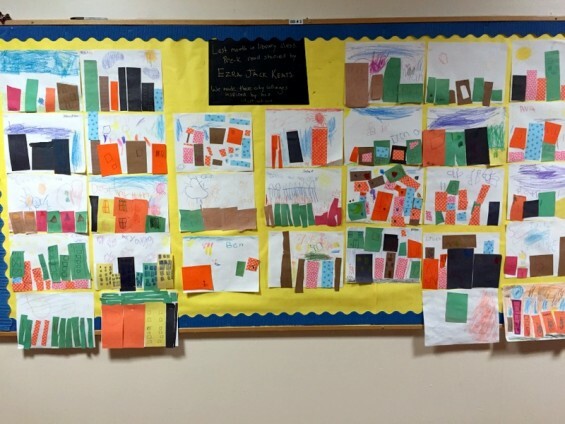 After we finished our stories we made these fall collages one week. I found this tree coloring page online and tweaked the size to make it just right. Then I put piles of cut-up construction paper at the tables and let the kids go to town with crayons, glue sticks, and the paper. In the month since I’ve seen students for the first time, things have been super busy at work. I’m up to the 970s with weeding the nonfiction section. You can see above what I have left to do (left side) and what I’ve already done (right side). I still have to decide on shelf labels, but I will definitely hit my first big goal of weeding and shifting the nonfiction section by Halloween. I’ve weeded a lot of books. And the vast majority of them were barcoded but never imported into our current library catalog. Not an exaggeration; on a cart of 200+ books I weeded this week, 10 were actually in the library catalog. I’m a little terrified of what’s left that’s uncatalogued. 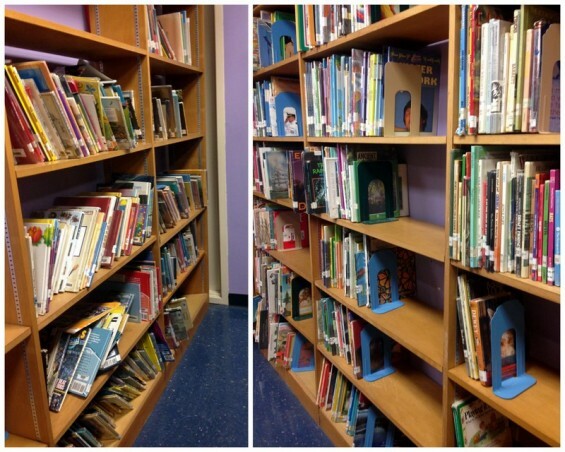 It looks like books were weeded but put back on the shelves. So that’s what’s currently giving me fever dreams. But things are definitely improving! 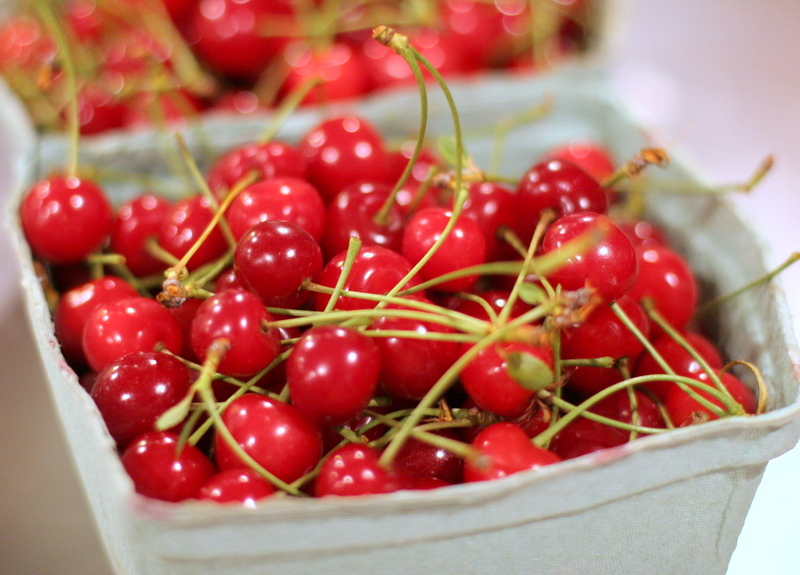 I loved today. Such a great summer day, and a great unwind after some stressful work times. Tuesday is my last day of work, so I’ve been closing up the library, saying my goodbyes, packing up and hauling home all of my personal work stuff. That has occupied a lot of my thoughts the past week, so today was a really nice respite. At this point I am mentally done and gone, I just need the days to physically end. Saturday was Dr. Seuss’s birthday, and last Friday was Read Across America at school. I made paper bag Cat in the Hat hats with all the K, 1, and 2 classes during the week. I worked with the PTA president to put together some fun prizes for a Dr. Seuss door decorating contest. I sent out Dr. Seuss trivia all week. It was a great week for books, and it was also the first time in my current district that I’ve tried working on school-wide programming for Read Across America. Last year I was on maternity leave by now, and the year before that it seemed like teachers really did their own thing. So I haven’t been in the spirit since my last big program 3 years ago. It was great.